Movva Venkata Rama Sarma , a scholar, humanist, man of letters and an educationist was born on September 6, 1920 at 8.47 P.M at Movva Village, Movva Mandal, Krishna District. He entered into a family deriving its lineage from the poet-saint-composer, kshetrayya, whose life and tryst with eternity was fictionalised in “The Bliss of Life”- a novel. 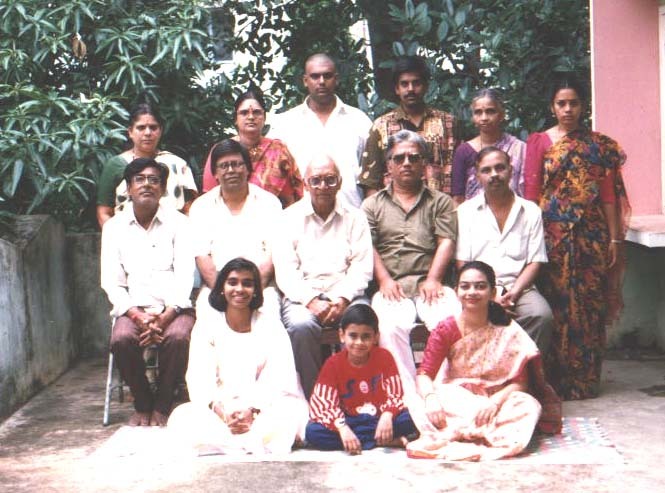 His father, Movva Rajgopala Rao was a landlord and a freedom fighter. His mother was Movva Subbamma. Slowly he moved on to Machilipatnam for SSC and Intermediate. Then he started concentrating on studies. He passed Intermediate in 1938. He got admission at P R College, Kakinada. 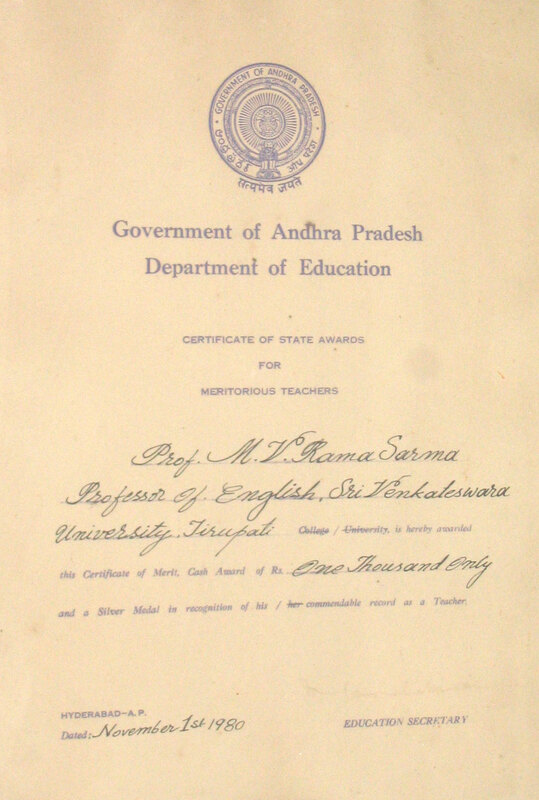 He was popular and liked by his Principal, Sri Pedada Ramaswami He completed his BA in 1940 and secured second rank in his group. 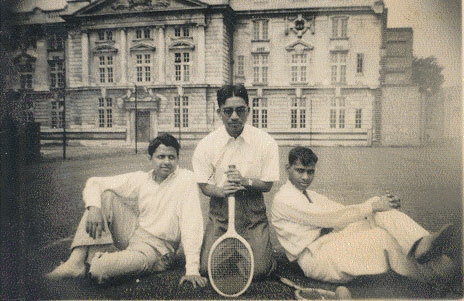 He appeared privately for M.A in English Literature at Nagpur University. He got admission for Ph.D and he worked under Prof Bethell. In England he had a trying time with Prof Wren of University of Oxford putting him again to M.A. He wanted to work on Benard Shaw, but his Professor refused. 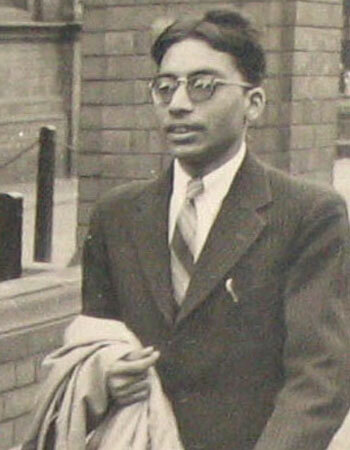 Armed with a foreign Phd in 1949, he returned to India in 1950 and sought job offers at Pune, Hyderabad, Baroda and some other places. 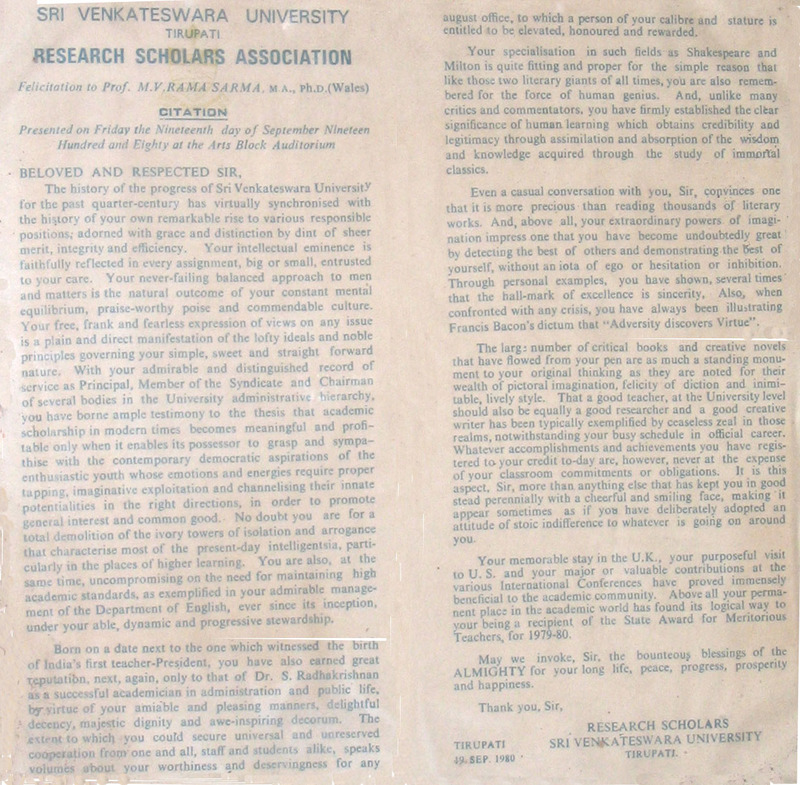 Finally he joined in 1951 as lecturer at Nirmala Collegel, New Delhi. 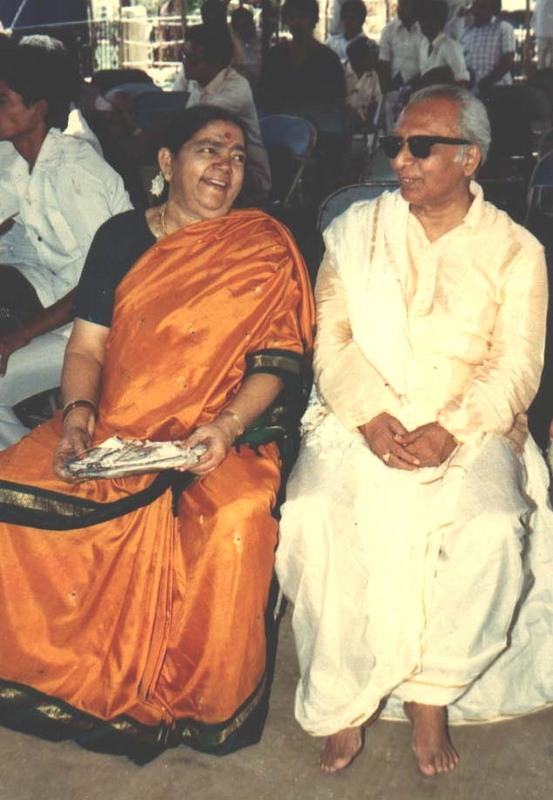 On October 1,1980 he assumed charge as the Vice Chancellor of S.V. University. 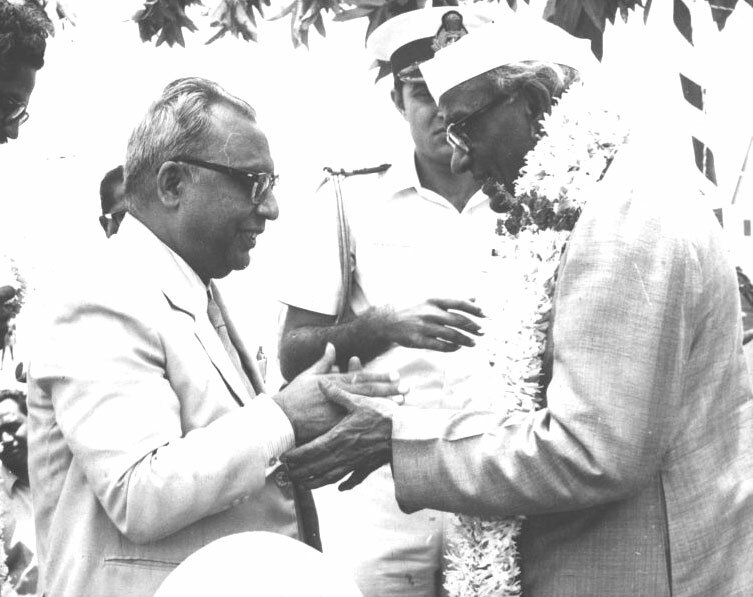 This was the first time that an internal Professor was selected as the Vice Chancellor. 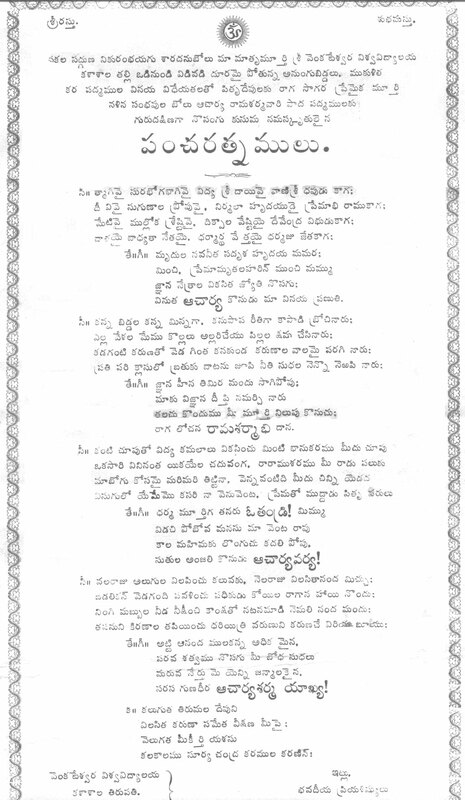 ఆంగ్గ సాహితీ జల దివి మదించి మిల్టన్ పండితుడుగా ఖండ ఖండాంతరాలలో అఖండ ఖ్యాతి గడించినమీరు ఈ గ్రామ వాస్తవ్యులు కావడం మాకు అత్యంత గర్వ కారణం. from your world's sphere whole galaxies do tighten the girdle of warmth and support to protect their star, their rabbi from the fret-fever and the dull-aches of this chilling world. On this occasion we recall with pleasure your manifold achievements as a brilliant student, gifted teacher, creative writer and able administrator. We have struggled through several years to become the employees of the University. Ultimately our dreams are made real by you. We remember gratefully a crucial decision you have taken to the benefit of us all. 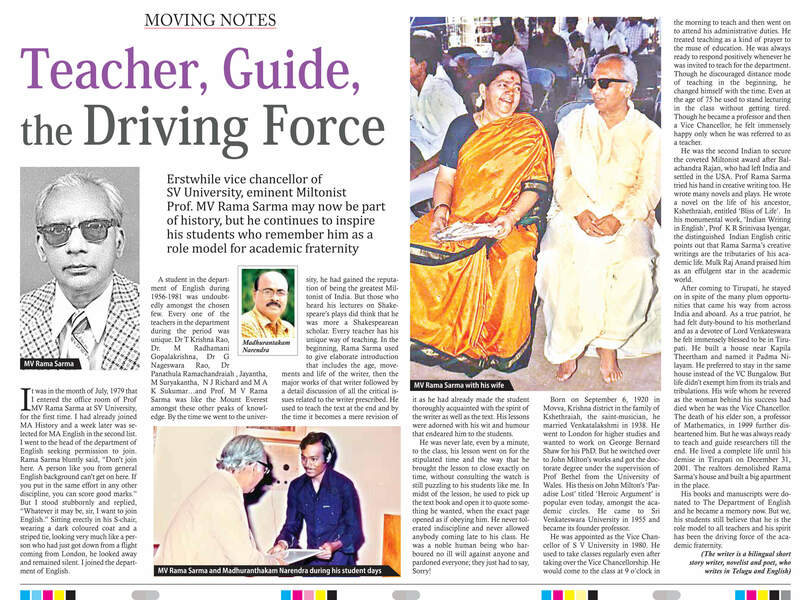 Prof. Rama Sarma has thus been one of the builders of the Sri Venkateswara University and it was natural – as natural as the ‘leafy luxury’ of a tree in spring – and a fitting climax to his career . Your memorable stay in the U.K., your purposeful visit to U.S and your major or valuable contributions at the various International Conferences have proved immensely beneficial to the academic community.